The Library is pleased to announce a gift of books that belonged to Jess B. Weiss, M.D., inventor of the modern epidural needle. 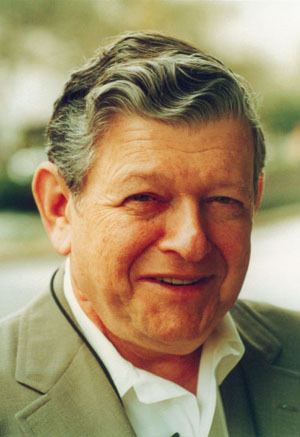 Dr. Weiss was a department chair at Harvard’s Brigham and Women’s Hospital in Boston for many years, and served as an Admiral in the U.S. Navy. He received lifetime achievement awards from both the American Society of Anesthesiology and the American College of Obstetrics and Gynecology. Dr. Weiss was a gifted and dedicated physician who served as a mentor to many individuals. He was also a humanitarian and an early advocate for women physicians and the underserved. Mrs. Shirley Weiss decided to donate the books to Calder after reading an article about the Library in Miami Medicine in her doctor’s office. In January, 2008 the National Institutes of Health (NIH) announced a revision to its Public Access Policy that went into effect April 7, 2008, and on March 11, 2009, President Obama signed a law making the revision permanent. The revision requires researchers to deposit copies of the final manuscripts of peer-reviewed journal articles, resulting from research supported in whole or in part from NIH, to the National Institutes of Health Manuscript Submission (NIHMS) system. 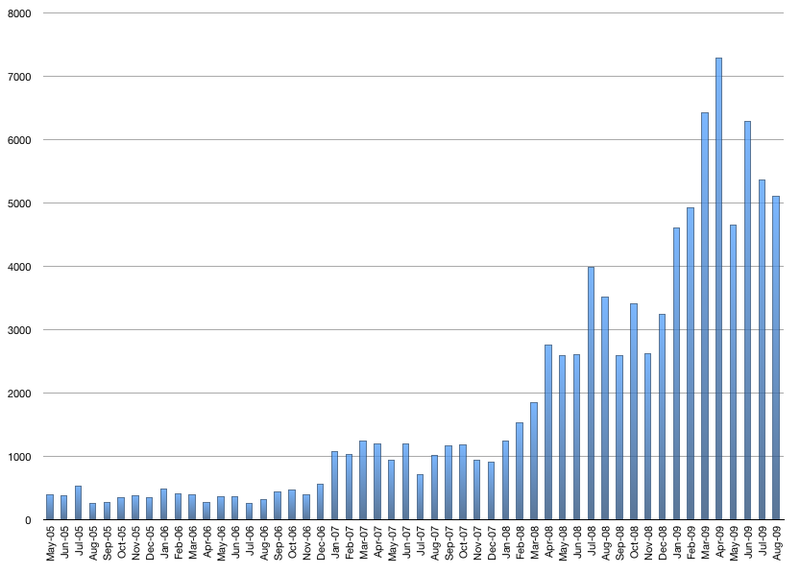 The effect of the revision on the number of manuscripts, submitted to NIHMS for public availability in PubMed Central within 12 months of publication, is seen in the chart below. Brenda M. Linares joined the Calder Library on August 31, 2009, as Manager, Finance and Administrative Librarian in Medical Library Administration. Ms. Linares was awarded a BS in Finance from the California State University-Northridge and a Masters in Library and Information Science from the University of California, Los Angeles in 2007. Prior to library school, Ms. Linares worked for several years in the financial sector. Following library school, she was accepted as a Fellow in the prestigious and highly competitive National Library of Medicine (NLM) Associate Fellowship Program. The first year of this two-year fellowship is spent at NLM. Ms. Linares then selected the Calder Library to spend her second year in Medical Library Administration. In addition to her financial responsibilities, Ms. Linares will continue to participate in the Library’s outreach activities. Emily J. Vardell joined the Calder Library on September 1, 2009, as Community Engagement Librarian and Collections Liaison. Ms. Vardell received a BA from Wellesley College with majors in Biological Chemistry and German Studies and a Master of Library Science from Texas Woman’s University in 2007. Prior to her library degree, Ms. Vardell did graduate level coursework at the University of Vienna as a Fulbright Scholar. Following her library degree, she was accepted into the NLM Associates Fellowship Program. She spent her second year of the fellowship at the Health Sciences Library at the University of North Carolina, Chapel Hill where she worked with on the university’s global health initiatives and with North Carolina public health practitioners and students. In her new position, she will be involved in the library's outreach activities and collection development. New Small Group Study Rooms on the South and West walls of the first floor. 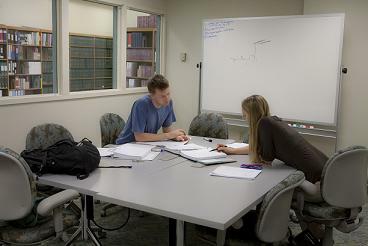 University of Miami Miller students are accorded priority access to all seven small group classrooms in the Library: three on the first floor, two on the West wall of the second floor, and two on the lower level. New Public Computers - There are now 33 new networked public access computers on the first floor. 23 computers require users to login with their MIT (Outlook) usernames and passwords. 10 computers on the west and south walls continue to be open access. There are also 5 new wireless access computers on the first floor and 9 on the second floor that can be accessed as “guest” or with a MIT (Outlook) username and password. “Guest” access is severely limited and does not include access to the Library’s purchased electronic resources. 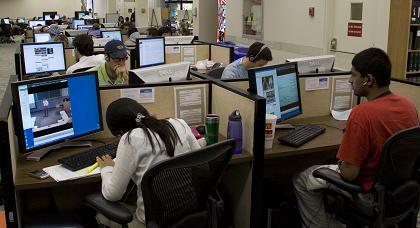 All 47 computers have software that logs users off after 30 minutes of inactivity. Users are encouraged to save their personal work on their personal flash drives to minimize any loss of work due to inactivity. Computer Lab for Students – A card access system was installed in the e-classroom on the third floor of the Library for use by medical students when the room is not in use for classes. The classroom has 20 workstations and one instructor workstation.